Fulfil is the World's First Protein & Vitamin Bar! Incredibly moreish, this delicious dark chocolate bar with a velvety cream layer & cookie biscuit base contains nine essential vitamins and 20g of protein - and has all the benefits of being low in sugar and high in fibre! Perfect as a mid-morning snack or post-workout treat, you will be sure to love this seriously tasty cookies & cream protein bar. Each bar is 55g. Soy crisp (soy protein, low fat cocoa, tapioca starch), bulking agent (polydextrose), gelatine hydrolysate, chocolate with fibres and sweeteners 10,9% (cocoa mass, dextrin, cocoa butter, sweetener (erythritol, steviol glycosides), inulin, oligofructose, low fat cocoa, emulsifier (soy lecithin), natural flavour), humectant (glycerol), sugar, oligofructose, cocoa butter, whole milk powder, maltodextrin, cocoa mass, soy oil, low fat cocoa, flavours, vitamins (vitamin C (ascorbic acid), nicotinamide, vitamin E (tocopheryl acetate), calcium pantothenate, vitamin B2 (riboflavin), vitamin B6 (pyridoxine hydrochloride), vitamin B1 (thiamin hydrochloride), folic acid, vitamin B12 (cyanocobalamine)), salt, emulsifier (soy lecithin). Excessive consumption can lead to laxative effects. Please note that this product is manufactured in a production facility that is working with a big variety of different raw materials inclusive wheat, gluten, milk, egg, soy, nut, peanut and sesame seed products. Fulfil Cookies & Cream is rated 3.5 out of 5 by 10. Rated 1 out of 5 by Kassy87 from Worst ever! This protein bar was like eating soil. It literally tastes like dirt. I took one bite and needed to spit it out. Tried another bite later and regretted it. 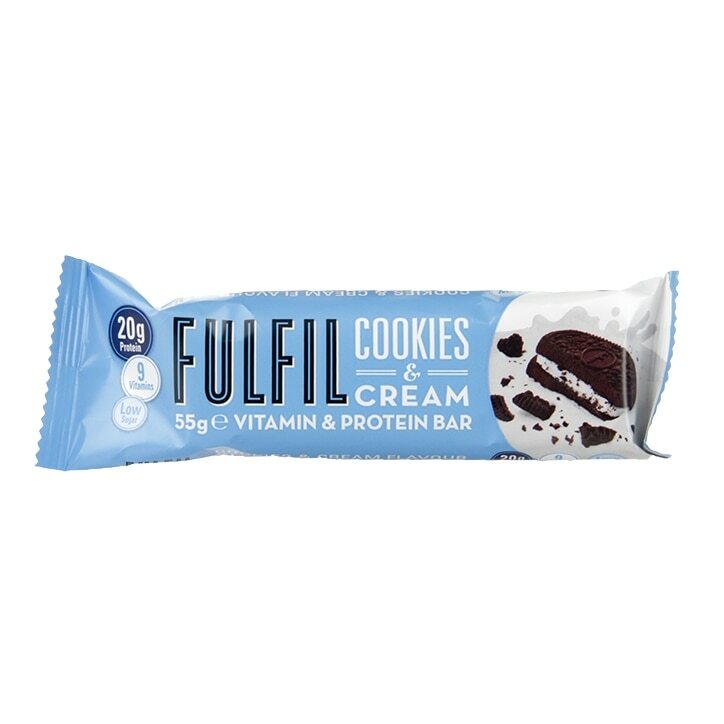 I often read reviews, but don't often write them, but I felt the need to as the Fulfill Cookies & Cream protein bar was so disgusting! The texture, taster and after taste were awful. My partner and I bought one each and both agreed it was the worst thing we have tasted in a long time. Definitely nothing like the Grenade version. Rated 5 out of 5 by Maggie S from Yes please It was the first Fulfil one that I had a pleasure of tasting and it's stayed my fave since. Beautiful flavour of cream inside the crunchy biscuit coated with dark chocolate which breaks up the sweetness in a nice way. Low sugar,fairly decent level of carbohydrates which can still make it a good snack as the opposite of being a pre- or post-workout fix. Thumbs up! Rated 1 out of 5 by cookiereview from cardboard bar i bought this excpecting great things, alas i was horribly disappointed. its a dry as Ghandi's flip flop. 'low sugar' is an understatement and you certainly do notice its missing. Very bitter 'chocolate' outter layer and no cream in sight. Rated 4 out of 5 by Boopie from More biscuit-y than most protein bars I was quite surprised at how hard and biscuit-y this bar was, considering it is cookies and "cream". Quite different from a lot of other protein bars out there which tend to have softer caramel layers. It wasn't as sweet either which makes for a nice change, but I do also have quite a sweet tooth so probably won't ever be my go-to bar. The chocolate was also a lot more dark and bitter than I expected but that made it more Oreo-y I guess. Rated 4 out of 5 by EB25 from Not sickly sweet, with a great biscuit texture. If you're used to chocolatey sweet protein bars, then this isn't for you. It's true to Oreo biscuit style, being subtly sweet with an ever-so-slight saltiness to the flavouring. The texture is amazing. Perhaps quite dry for some, but as someone that's tired of chewy and sloppy gunk, it's nice to eat something that's like a real biscuit. Following a sugar free/keto discipline, this bar hit all the right spots for me in not being too sweet and nicely replicating the textures I can't usually eat. It's got a little more net carbs that I'd expect for such a 'savoury' bar, but it's nice to have something different. Rated 4 out of 5 by Oktagon33 from Protein bars Very good, but PHD SMART ones low sugar even better.